Art is near and dear to my heart. I grew up with passion in drawing, painting, sculpting, graphic design and going to art museums. I graduated from an art school with a degree in photography. In Cameroon, unlike in the US, art is not valued and is often a rare treasure. 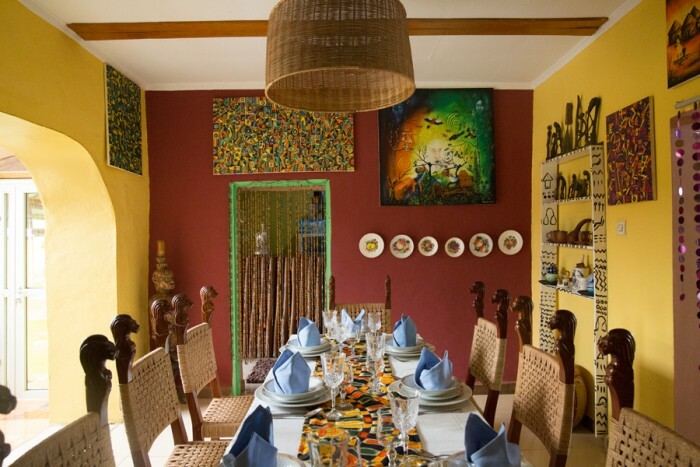 Thanks to a restaurant that displays beautiful paintings, I was able to connect to an artist based in Cameroon. To learn more about the situation of artists in Cameroon, I interviewed the artist who created beautiful paintings that are displayed in the restaurant. I’m Blaise, known as Blaise Afrique. Afrique is not a name. It’s more like a verb to describe my work. I’ve been painting for six years. 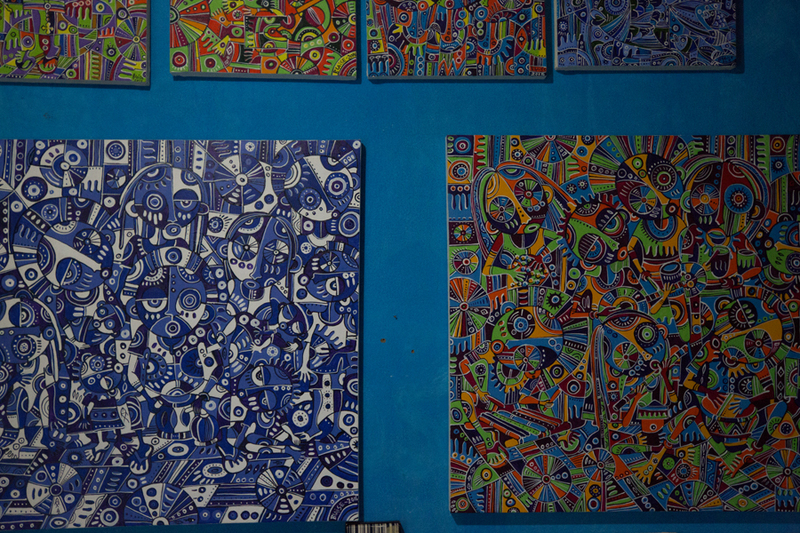 Art in Cameroon is more like hidden. As a child, I loved to draw from observations. I could draw food like oranges. I could conceive images in my head and draw it. Although as a child, my drawings were more like a child. So around secondary school, during long vacation, my father would send me to an artist workshop. The funny thing is that the artists were not teaching me how to paint. It was more like commercial art like billboards and t-shirts and badges and stamps and once in a while, some people needed a painting on billboard. So then at that point, I could observe the master painting of the billboard. [The teacher] was not into painting as an art, but he used it more like additive element in commercial art. He produced no professional painting. I was frustrated because I wanted to learn how to paint and produce art. I quit going to those workshops during the long vacations. Even though I quit, I still had a feeling for art, and I kept drawing in color pencils. Even though I kept drawing and drawing with color pencils even during the last year of high school. I believe the turning point was created in high school where I felt a strong impact. The [high school] teacher noticed my talent in drawing even though I was a science student. So, I was to present in the school art competition. Well the good thing is I was able to win. So from there, I felt my time more to art. Though it was my final year in high school, and I had exams, I had to figure out a way to bring my book work and art together. By then, I finished high school and like every young Cameroonian, I had to write a concur [entrance exam] to be trained as a teacher, but they did not work. [Rachel’s note: In Cameroon, many exam takers often wrongly do not pass entrance exams due to corruption and not giving bribes.] Then, I wrote a concur to be a trained as a nurse and succeeded but my dad did not have the money to pay for my training. So in all the frustration, I embraced art. I fully embraced it. 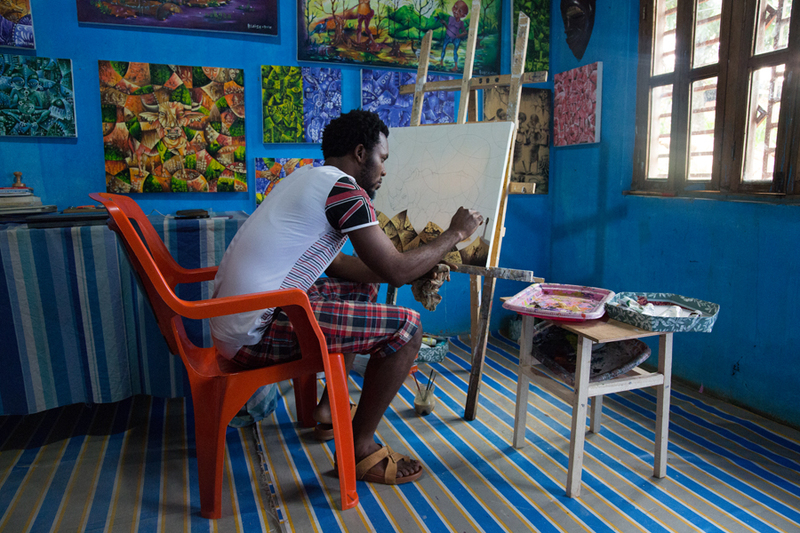 When I had difficulty [painting], I was aware of the fact that I needed to be trained. At that point, I realized that the only art school in Cameroon was in Fouban in the West. I wanted some information to be sure the school was outstanding compared to other art universities around the world. 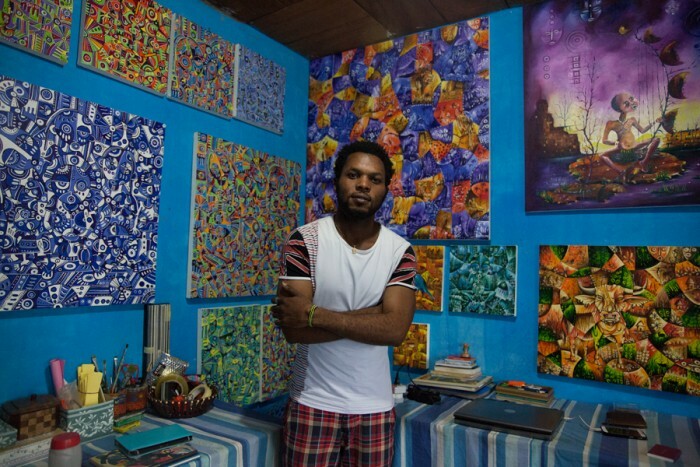 So, I went to a Brazilian friend even though he was old, around 60 years and he was an artist too and an art teacher in Brazil before coming to Cameroon as a missionary. After we visited the university, he told me it was not outstanding. So, he told me it would be a waste of time. So he promised me to train me on personal basis as long as I would buy every material I needed. At that point, I started to teach mathematics in secondary school as a PTA [Parent Teacher Association] teacher. I taught mathematics in form [grade] 1 and 3 in a new school that had just opened. So during that time, I was able to save money for my salary to get materials for painting and clay model. I did a two year program with the Brazilian teacher. After that, I was able to get a sculpture that fetched me money to invest into painting. So I brought paintings, materials and started painting. From the time I started painting, I kept on searching for a style, but I decided to stay open to all art work I come across. So initially, I was able to see artist like from books. During training, I started looking in books and even internet to see the works of great artists of all times like Michelangelo, Leonardo da Vinci, Caravaggio, Jackson Pollock, Picasso, French impressionist painters like Monet, Manet, and Matisse, and Mondrian. I didn’t get inspired by the work of this generation [today’s generation in Cameroon]. I was inspired by artists form the past, especially Picasso and Salvador Dali. In abstraction, I was inspired by Picasso. In surrealism, I was inspired by Salvador Dali. So, personally I decided to concentrate on abstract and surrealism. So I’ve been painting and I kept improving and evolving. How would you like to bring art from being a hidden treasure to the forefront? First of all, it’s a difficult task on a personal base. So to do that, I need to be able to encourage more people to become artist and the only way to do this is to incorporate art into educational system so that every educated Cameroonian can be able to appreciate art that way more people will be able to become artist. Because as of now, people don’t look at it like it can be professional. They always look at it as a hobby. The second, more and more people need to invest in art materials because even artist are discouraged because of the cost of materials. Even when you have the money, sometimes you can’t get materials because they are not there. The third, even the few artists that are here in Cameroon, they don’t collaborate. The artists hate each other. Recently, I received a call from another artist I respect very much claiming that I copied his work. Meanwhile I don’t visit his workshop and I don’t even know his website. He was the first artist I encountered as professional. He used to be around at art competitions in high school. I visited his workshop once for ten minutes to ask to be trained. There was a time, I was teaching a Korean girl how to paint and I had to travel for two weeks. So I sent her to this artist so that he could train her for two weeks while I was away. When I returned, the student returned to me but when he called, he also mentioned that I took the student from him. When I asked him to meet me so that I would know how I copied his work, the discussion ended. So because of this, there is no collaboration because every artist feel superior. Old artist don’t want to encourage new artists. If there is collaboration, maybe there is a possibility for artist to access art materials at cheaper price. Because of that, the system remains like that. In Cameroon, there are no art stores? 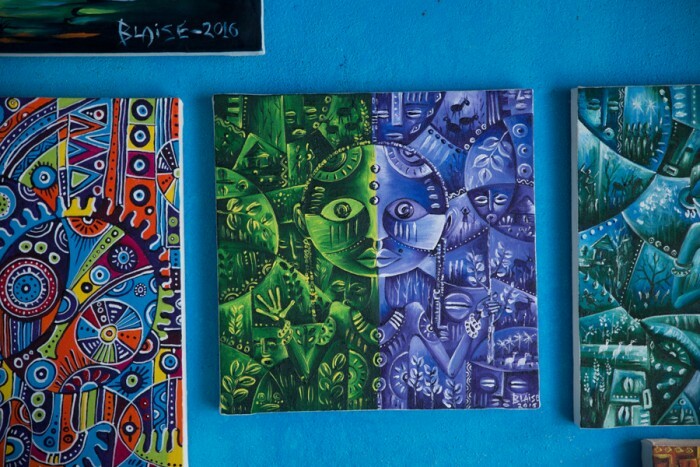 Foreigners are the people who are investing in art materials in Cameroon. Few Cameroonians are invested in art materials. I have to go to Douala to get materials because there is no place in Bamenda. So you can imagine being an artist and a single tube gets finished, and I have to travel all the way down to Douala to get it. It’s an eight hour journey in bus that is all together 16 hours round trip. So you can imagine the difficulty. You can imagine what young artist can face. That is an artist who cannot buy a huge stock of materials. The young people I’m training always have this difficulty. The young people I’m training buy maybe five tubes and then when they run out, they have to go to Douala and they may not have the money to pay for the journey to restock. Are there art museums in Cameroon? There is one in Yaounde and one in Douala that I know of. I have been to the one in Douala. I have three possibilities to sell work. I have advertised to my Facebook page, Blaise Afrique Gallery. Also I sell through a restaurant, Travelers. I have a permanent show of my work there. This restaurant has customers like Peace Corps Volunteers and Cameroonians who are appreciative of my work and love to eat there. Also, I have friends who are into interior decor and so, they are able to propose work to their customers. The last is I go to churches, [show paintings on my tablet], and say, “I can do this for you.” So in the future, when they have a job, they call me and I do it. That is basically for painting murals. Can you tell me the very first time you sold a painting? I used to keep my paintings at Handicraft restaurant. So, there I don’t know if my paintings were sold or stolen but I noticed that there was no response when I asked about a painting I did [that was once on display but no longer there]. I talked to the Handicraft restaurant, and they told me nothing. So, I stopped keeping my art there. I never got money from there. I think six months later, after I stopped putting art there, I got a contract to supply 20 paintings to Ambit Hotel. I think that was the very first time I got paid for a painting . They learned about me from Handcraft restaurant. 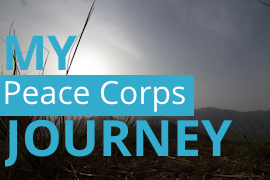 But my best customers have been Peace Corps Volunteers. So, the very first Peace Corps Volunteer who bought a painting from the restaurant, Travelers, was Nadia, and she was also the very first customer to buy a painting from Travelers. Then Alex came, Then you came and then Tara came and Tara’s friends came, and it spread to others. Tara’s mother came. Then I also have Cameroonians and foreigners. There is a woman who is into forestry who came and bought painting. I have sold four paintings to the regional hospital and then to some people in law. I have Cameroonian friends who come [from America] here during Christmas season to buy paintings and take back to America. I have a friend who takes my work to sell in Italy. When you first sold the painting to Nadia, is that when your business bloomed? Yes, my artist came alive. Blaise’s paintings are beautifully displayed at Travelers, a restaurant that is popular among the Peace Corps Volunteers. How did you get Travelers to agree to display your paintings? I can say it was one of my biggest difficulties in my marketing. But even though initially, I must get the woman who owns the place to agree. So, the very first time I went to her, she refused. When she refused, I knew I had to make her see the need for my art on her walls. She told me she did not have money to buy art. But I told her I was not interested in selling work to her. But I was just interested in collaborating with her. So, I left the place and came back after some time to see her again. I prepared what to tell her. I told her imagine your customers coming to buy food, and there is art all over the place. While waiting [for food], they have beautiful art to admire and spend time. They will not notice how long it takes time to order food. That way, they will think you’re super fast in serving the food because of the art that occupies them while preparing the food. So, she listened to these words and said that I had a point but then she asked, “Are you sure that your beautiful art will keep them busy?” And I said, “yes.” And she told me to bring the paintings [the next day]. When she saw the paintings, she was surprised because she did not know that I had access to the right materials. So she never imagined the paintings to be that good but they were beautiful. We placed them in the restaurant. After three months, I have my first customer [Nadia]. It was two years ago when I started putting art in the restaurant. How do envision yourself in the future as an artist? Personally I see a bright future in art. Reason being that my work has been commissioned by all kinds of people, foreigners and people who live in Cameroon. I have been able to paint murals for churches and houses. I’ve been able to train already two people. My work continues to attract attention. So I know there is future in my work.